Property Location In the heart of Myrtle Beach, Rodeway Inn & Suites is close to Midway Park and Family Kingdom Amusement Park. 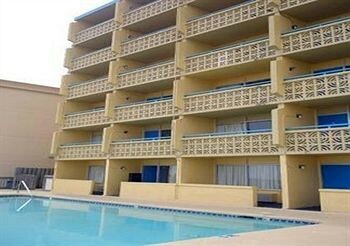 This beach hotel is within close proximity of Mount Atlanticus Miniature Golf and Art Museum of Myrtle Beach.Rooms Make yourself at home in one of the 76 air-conditioned rooms featuring refrigerators and microwaves. Complimentary wireless Internet access keeps you connected, and satellite programming is available for your entertainment. Conveniences include phones, as well as desks and irons/ironing boards.Rec, Spa, Premium Amenities Be sure to enjoy recreational amenities including a spa tub and a seasonal outdoor pool.Business, Other Amenities Free self parking is available onsite.